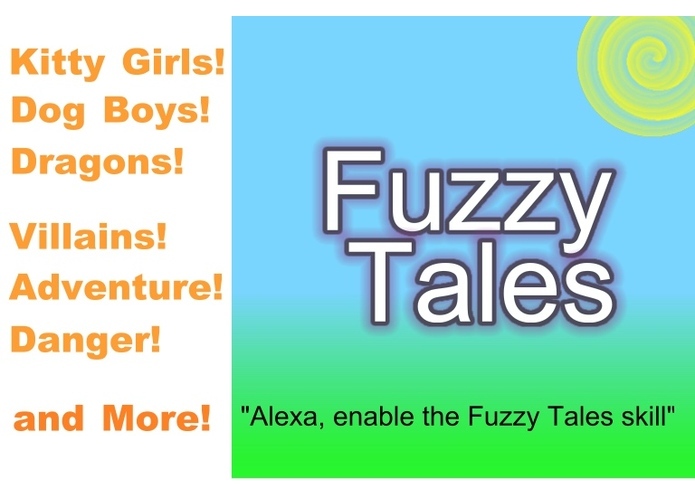 Fuzzy Tales is an interactive story set in a kingdom filled with talking animals. Adventure and mystery await! My kids have seen me building Alexa skills for the last few months. They have been enjoying using Echos and we made a few silly things using the Storyline software to make Alexa skills. When I told them about the contest, they each came up with an interactive story they wanted to tell with an Alexa skill. We decided to work them into a single fun skill that would both tell a fun story, and teach kids some important life lessons along the way. We wanted to add elements that would teach kids about investigation, preparation, forgiveness, and courage. These things are taught using a wide variety of decisions and consequences. Most decisions are binary (two choices) to help polarize the decisions and resulting consequences. Interactive story telling is extremely conducive to create learning paths for life choices. Sometimes you make a poor choice and are penalized for it. Sometimes the results of a choice don't seem fair. That happens in life, and we can always try and make the best of things, celebrate our victories and work harder to do things differently and learn from our missteps. We tried to introduce these elements carefully, but with real consequences in the story. It uses a branching storyline to let the kids play as a kitty girl or a dog boy. They hear choices at certain points in the story, and can select from a couple different options at each branch. The branches usually involve a bold choice, or a careful choice. We also came up with a Secret Code system, so if you hear a code word as you play, you can jump right back to that place in the story without playing through the whole thing each time. In addition, we try to teach that there are other options besides the obvious ones sometimes. Some examples: The kids can choose to be merciful, instead of picking a fight. The kids can choose to forgive, instead of being vindictive. The kids learn how to disarm a problem with cleverness and wit, instead of resorting to violence. The kids learn how to speak up for themselves when they're being bullied, or see someone bully someone else. The kids learn how to apologize and make amends, instead of holding their ground to win an argument. I usually use node.js and the Jovo framework to build skills, but I wanted the kids to actively participate so we used the Storyline website to build it visually. We tested lots of different intent combinations and came up with choices along the way that were unique enough to not present language detection issues as the story grew and grew. We needed to combine 2 different stories into a single skill, and each of those stories had 2 major parts. So we originally were going to call the skill Four Fuzzy Tales. But was we worked on it, we realized that we wanted to leave the flexibility open to add more and more over time. The kids needed a lot of time between working sessions to think and be creative, so we started early. They chose the method which worked best for them. My daughter wrote an outline, while my son drew out his story. He wanted to use elements from his favorite game, Minecraft, but I explained it was the brand of some other company and we couldn't use it. So he had to become flexible. 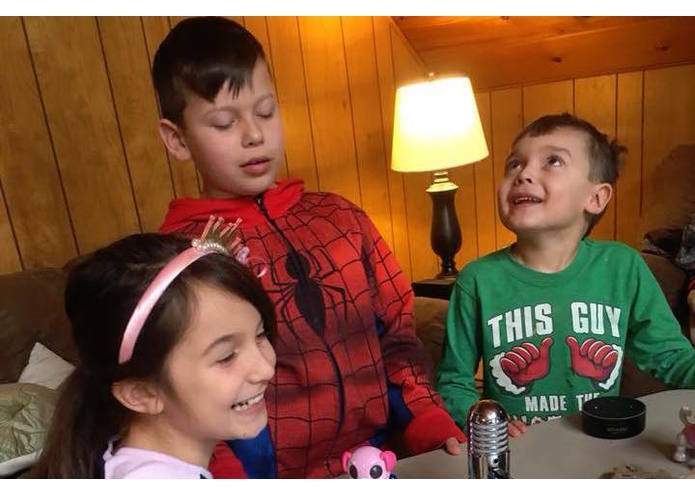 Getting the kids to focus on the different tasks, like recording animal noises without interrupting each other, or feeling like one was getting cooler story pieces than the other. We found a good balance and went with it. Also proud to have shown them how to start, work on, and finish a project. We also worked hard to come up with story choices that would teach kids specific things, and some of them are harder. Sometimes you are brave and rewarded for it, other times you can have some negative consequences. Fortune favors the bold! Getting them to sit down and record a promo video was extremely difficult, but fun. Along the way we shot 45 minutes of footage, and they got to learn how actors have a difficult job, doing repeat takes of a few lines of dialog sometimes, or how having props in a scene can make things difficult for shooting a video between takes. Kids can't be forced to do something that seems fun. It has to be fun, and if they're fully invested in a project with their own ideas and creativity, it is a blast to work on. I'm not a kid anymore, so I needed to relax the control and let them run with their ideas, which came out awesome. More tales, more story branches, including unicorns and wolves. We'd love to add music and more sound effects as well, and are planning out the next phases. I did the main skill creation, helped work in teaching elements, and guided the kids with language and grammar. We're so excited to have been chosen as a finalist project! The kids screamed when I told them. We're honored!